On a visit to Tallinn, the US Defense Secretary said 250 tanks, as well as artillery and other military equipment will be put in seven countries, whose territory stretches from the Baltics to the Balkans. US Secretary of Defense Ashton Carter announced on Tuesday that NATO members in Eastern Europe had agreed to plans for the US to spread military equipment across seven countries along Europe's border with Russia. 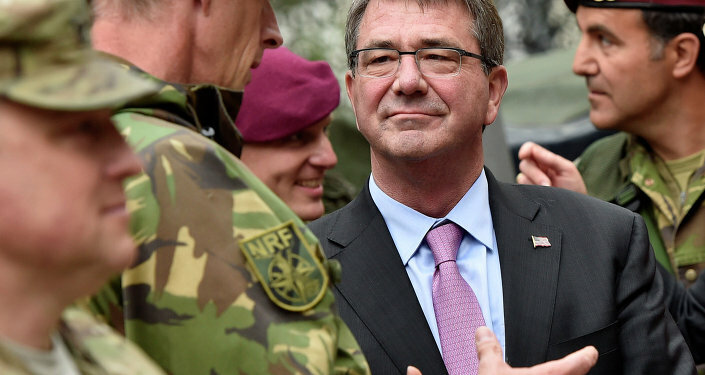 "We will temporarily stage one armored brigade combat team's vehicles and associated equipment in countries in central and Eastern Europe," Carter told the press in Tallinn on Tuesday. "This pre-positioning… includes tanks, infantry fighting vehicles and artillery." "Estonia as well as Lithuania, Latvia, Bulgaria, Romania and Poland have agreed to host company-to-battalion-sized elements of this equipment which will be moved around the region for training and exercises," said Carter. The heavy military equipment, intended to supply a company of 150 soldiers, or a battalion of 750 soldiers, will include 250 tanks, Bradley infantry fighting vehicles and self-propelled howitzers. According to information from US military officials, much of the necessary equipment has already been shipped to Europe, and some will also be located in Germany. "The most aggressive step from the Pentagon and NATO since the Cold War." "If heavy military weapons such as tanks, artillery batteries and other weaponry really does appear in countries in eastern Europe and the Baltics," warned Yakubov, "Russia will have no option but to strengthen its forces and resources on the Western strategic front."